Eleanor Chai’s poems require delving below the surface of each compact, enjambment-packed stanza, forcing the reader through a process of discovery not unlike Chai’s own origin story. Impossible now to see the phrase “Standing Water” and not think of Zika; of the ads on the subway, especially the one in neon blue-and-yellow, with text that appears as if stamped on. “FIGHT BACK NYC,” the campaign demands, in block letters. The first step to preventing the spread of Zika and other mosquito-borne viruses, the ad instructs, is removing standing water—from trash cans, from the drainage trays of potted plants—so mosquitoes can’t breed. 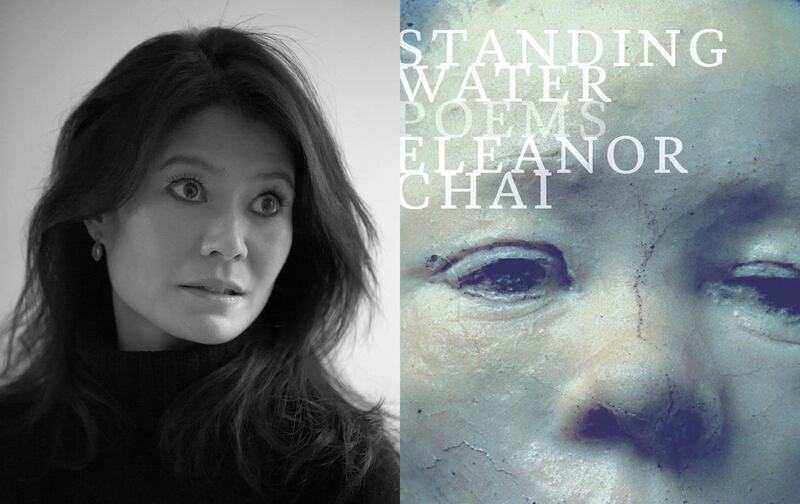 I worried when first encountering Standing Water, the debut collection of poetry from Eleanor Chai, that an association with Zika would distract from the book’s merits. The threat of infection was fully on my mind: I’d tucked it in my bag as I was preparing to leave for five days in Cartagena, Colombia, which is classified by the CDC as alert level 2 (“Practice Enhanced Precautions”). Yet it turns out that the specter of tropical, sexually transmitted disease is not a distraction at all. It’s an excellent frame through which to read Chai’s debut. The narrative collection of poems follows Chai’s efforts to grapple with the story of her birth and its repercussions, revealed to her only late in life. Raised by her mother’s parents in Korea after her mother experienced severe post-partum depression and was institutionalized, Chai was returned to her Western father, an unknown, virtually foreign child, at the age of 5. Caught between cultures and momentarily robbed of language—her father refused to let her speak Korean upon her return—Chai wrests with themes of disease, inheritance, and language through the text. “Standing Water” is narrative, spiraling outward from Chai’s dread-inflected depiction of standing water, where “Strain / humanity will never be rid of—” grows, to a meeting between Chai and her father having dinner in Paris, France. It is a moment of anagnorisis, as Chai learns her origin story for the first time. The mood is stony, Chai reflects: “Whatever he was looking for or from / I am the uninvited one.” Laypeople speak of fighting disease, as though it belongs only to outside forces, but by the time we are infected it’s already incubated within us, unseen and often undetectable. The uninvited one. What grows without our notice? Mosquito larvae, Zika, Vibrio cholerae, mental illness. Children, who might seem to belong to a parent but quickly become their own. (What breeds within our breeding?) In children, too, incubate inheritances, revealed as time goes on—a father’s round eyes, a mother’s startling curtain of dark hair. Throughout “Standing Water,” and the book itself, Chai zooms back and forth in scope, panning from the visceral image of V. cholerae, which cause cholera, to straightforward narration, as in the moment of revelation from her father. He continues. He goes for the kill. they dilate wide as eggs. I will not flinch at what he says. I met her once before we married. Strange? Chai wonders. What is strange? Chai herself, for one, whose very existence acts as a wedge between her and her family, a blockage of sorts—in a few poems, she mentions experiencing violence from her older brother, the eldest child angry that his mother was taken away. This strangeness is specific and has character: it refers to mental illness, of course, but also to race. Throughout Standing Water, Chai alludes to her biracial identity with modifiers that keep it on the surface of the text, ever-present reminders for the reader: the “exotic” wood of a Parisian bar, the “oriental” visual of V. cholerae, white particles in “rice water.” In combining the language of disease (“eggs,” even, in the above stanza, conjure not omelettes but mosquito larvae ready to hatch), with the language of the exotic, Chai invokes the fear of contamination by the other. The story of Chai’s entire existence is born of out of this fear of contamination: that her birth might send her mother spiraling, as it did, into post-partum depression; that her presence is a reminder of that which took the beloved mother away. (Chai notes that her father didn’t want her to be born, but there was only one physician willing to perform an abortion, and only in a living room—and thus she came to be.) Anchoring her narrative with the imagery of infectious disease makes Chai’s dramatic family history vibrate at a higher pitch, colored by fear of contamination. It feels particularly prescient now, under threat of Zika, where we must remember that some diseases are new and that science is tremendously ad hoc; that what breeds in standing water and what breeds within us isn’t necessarily fully understood. As the foreign, displaced nature of Chai’s identity manifests itself across the surface of the text in carefully chosen modifiers, it also manifests in the presence of Chai’s body, particularly her face, which appears in the text twofold: in the face of her mother and in that of the model for a Rodin sculpture, Little Hanako, which Chai encounters while in Paris. after eating sorbet cones by the path from the pond? a father to speak so? You are where it began. forebodingly strange, then utterly native. Having witnessed where she was from, Chai is forced to face her origins, and her physical embodiment of those origins. “Once I saw the figure of my mother, / her face, I could no longer imagine / I was immune to biology.” What do we inherit? Do we always know? Standing Water suggests that we do not, that we cannot. After all, none of us are immune to biology. In “Trust,” Chai opens with a bucolic first sentence: “This is my calm world: sesame and soy and fat golden melon— / This world is glazed celadon, blues, grays, olives and clay.” Chai forgoes the tight enjambment that characterizes many of her poems, which force the reader down each stanza without a sure idea of where it ends, favoring longer, neatly encapsulated lines in “Trust,” a poem about returning to Korea, where her “childhood lies / where and when it survives.” It is a gentle reminder of not only what Chai has lost but what she has loved—a surprisingly quiet, vulnerable confession in the midst of a chaotically emotional text. “I have to write myself in / to make my way out of the / tiny child on the screen,” Chai says, of watching an old family movie. Perhaps because Chai is telling a story that belongs to her but for which she is not a primary source, Chai writes from referents—from a home video, from photographs and sculptures and objects, drawing on things that are made to make herself.